A 2 quart Dutch oven is big enough to use in a small household or when you just want to cook a small dish and don’t feel like having to many leftovers. Very good for baking cornbread I read on a consumer forum about this small size dutch oven. This Le Creuset 2 qt Dutch oven comes in many colors to match your kitchen decorum. The quality of the Le Creuset is famous and this makes them a little higher in price. Lodge is a well know “Made in the USA” brand and there is no doubt about the quality of their cast iron cooking ware. This 2 Quart Camp Dutch oven gets a 4.9 star customer rating out of 5 stars. It measures 8 inches in diameter and is 3 inches deep. The lid can be used as a griddle when turned up side down. Comes pre seasoned and is therefore ready to use out of the box. This lodge is the number 1 best seller in his range. With a price under $30 this is a serving pot that can be used for many types of cooking. 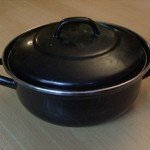 This 2 quart Dutch oven is most used for soups and stews. Pre-seasoned and therefore ready to use. A made in the USA Dutch oven from the Lodge company. “This is a wonderful cooking pot for one or two people. Last night, I made Spanish rice for two friends for supper. This pot made excellent Spanish rice and the pot lends itself a plesant presentation at the table. This made just enough Spanish rice without having leftover issues. This pot is, of course, cast iron yet it is much lighter than other cast iron products I own making this pot easy to lift. As an experiment, I discovered one can even make omeletes in this pot as well or better than the expensive omlete pan I have had for years. This past Sunday morning, I made a rather remarkable Quiche Lorriane for special company. The quiche was tall, light and fluffy and again the cast iron made a wonderful presentation at the table. Read some complaints about the lid not fitting to well on some of the Bayou 2qt dutch oven, but others mentioned the great quality. Like always we recommend to check the Dutch oven right when it arrives and send it back if you are not completely satisfied. This 2 qt Dutch oven is good for the price you pay for it and can be used in many different ways. Although some people do not agree with this we have been reading that a cast iron Dutch oven can be use on any heat source including induction stove-tops. The 2 quart is very good for bread, soups and as a rice cooker. If you are particular about buying made in the USA you have a variety if brand to choose from with Lodge Dutch ovens being the most know brand. For all our Dutch Oven Reviews click on this link.